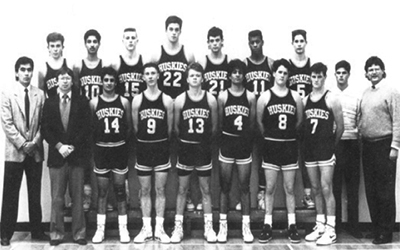 A quarter of a century ago, the North Delta Huskies 1989 – 1990 Senior Boys Basketball team completed one of the most memorable years in the history of high school basketball in British Columbia. Along the way to a 41 – 3 overall record, they captured the Delta Police Tournament, the Emerald Tournament at Vancouver College, and the prestigious Western Canada Tournament in Kelowna. The Huskies swept the Fraser Valley title and then completed a remarkable 38 game winning streak, with a thrilling victory over Richmond, to claim the school’s third Provincial AAA title. Led by a talented core of six returning seniors, forwards Chad Johnston and Oran Walwyn and a quartet of talented guards, Mitch Berger, David Houston, Kelly Gordon and Nobby Heran, the North Delta Huskies entered season ranked #2 provincially. Though starting the season with just four victories in seven games, head coach Bill Edwards was not panicked. Coach Edwards claim that “right now we are a poor imitation of what we’ll be later in the year” proved to be very prophetic. In late January, before a sold out home crowd, the Huskies faced an undefeated Richmond Colts squad. In what turned out to be a rehearsal of the provincial final, North Delta had extended their winning streak to 20 games, with a hard fought 90 – 80 victory. The top ranked North Delta squad, riding a 32 game win streak, entered the Fraser Valley tournament as the consensus favourite. After eliminating Yale and Pitt Meadows, the Huskies went on to avenge an earlier loss to Abbotsford by beating them 86 – 76, to capture their first Valley title since 1972. In the 1990 Provincials at the PNE Agridome, the pre-tournament favourites were the Huskies and the Colts and they squared off in a memorable final. In the semi finals North Delta dispatched a tough Kelowna squad and Richmond easily defeated St. Thomas More. In a repeat of the 1975 final, the two teams engaged in what was one of the most exciting finals in years. It was only in the last minute of the game that the Huskies pulled away recording a 75 – 66 victory. Throughout the season a number of individuals received recognition for their performances highlighted by Johnston’s MVP at the Provincials and Berger’s MVP at the Fraser Valleys. Team members: Jas Ranu, Chris Bremer, Jeff Heron, Kevin Dowle, Glenn Scott, David Houston, Nobby Heran, Oran Walwyn, Jeff Bahnman, Kelly Gordon, Troy Opper, Mitch Berger, Paul Rai, Chad Johnston, Carolyn Jackson (Mgr. ), Tara Fishburne (Mgr.) Head Coach – Bill Edwards. Assistant Coaches – Tyler Kushnir, Richard Hunt.